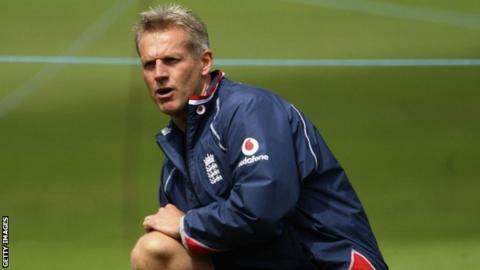 Peter Moores will name the first England squad of his second stint as head coach on Thursday. Moores and a selection team featuring Angus Fraser and Mick Newell will pick a group for the 9 May one-day international against Scotland. The match in Aberdeen precedes a five-match one-day series against Sri Lanka. Batsman Garry Ballance and all-rounder Chris Jordan are in contention, while Steven Finn could return to the international ranks. Middlesex seamer Finn, who left England's disastrous Ashes tour early when he was deemed "unselectable" by previous coach Ashley Giles, has returned to form with 23 County Championship wickets at an average of 17 this season. Sussex quick Jordan has 11 at 19, and Ballance has scored two centuries in three matches for Yorkshire. With Stuart Broad not fit, the untried pace trio of Harry Gurney, Jack Brooks and Tymal Mills could all be in the frame. England were thrashed in all three series in Australia in the winter and suffered an ignominious defeat by the Netherlands at the World Twenty20 in what proved to be Giles's last game in charge. Moores was reappointed on 19 April after serving as England coach between 2007 and 2009. He will team up with national selector James Whitaker, Middlesex managing director of cricket Fraser and Nottinghamshire coach Newell to pick the squad.